NY2913 2362. 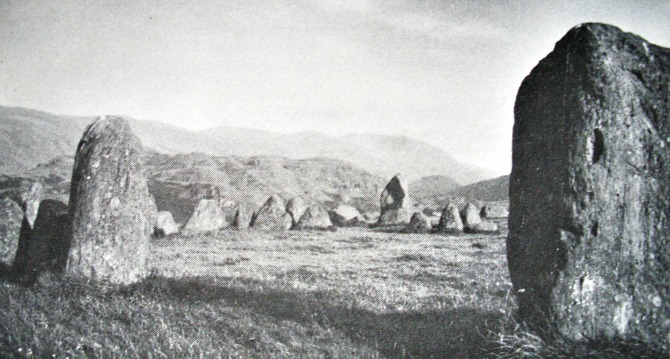 Castlerigg stone circle or the Druid’s Circle stands on a flat hilltop close to Castle lane just south of Goosewell farm, 1 mile north of the A591 at Castlerigg village and 2 miles east of Keswick. Although referred to as a circle, it is actually oval in shape and probably dates from the late Neolithic to the early Bronze-Age periods 3,370-2,670 years BC. There are some excellent panoramic views to be had from the circle of the distant mountains of the lake district. All of the stones and boulders ranging from small and large ones that make up the circle are glacial erratics made of metamorphic slate; these would have been moved into a suitable circular position. There are between 38-40 standing stones (also called carles) the correct number being difficult to count, 33 of the stones are standing while the rest are recumbant. Inside the circle 10 stones form a rectangular cove or sanctuary, the eastern section of which connects with the outer circle (perimeter), and is regarded as quite an unusual feature. At its most widest point the circle measures 32 metres (107 feet) in diameter and at its narrowest point it is 29 metres or roughly 100 feet. The height of the stones varies from around 1 metre to 2.3 metres, with 8 of the tallest stones being at the northern and southern sides and weighing between 15-20 tonnes. At the north-east side of the circle there is an entrance or portal between the stones which is 3.3 metres wide. Some 90 metres to the south-west near to a wall there is another boulder, or outlier, that may or may not be connected to the circle itself. We can never really be certain what the circle was used for. It may have been a place where ritualistic ceremonies took place, or it was used it as a sort of astrological observatory for watching the skyline and calculating the movement or alignments of the sun, moon and stars, especially at the soltices. Shamanism – the spirit world was something the ancient peoples were interested in, coming to the circle to say prayers to their dead ancestors. One of the stones at the eastern side is said to be magnetic in nature, the whole site acting, perhaps, as a kind of powerpoint. A number of leylines are said to pass through the circle. Categories: Castlerigg Stone Circle, Stone Circles | Tags: Castlerigg Stone Circle near Keswick in Cumbria, Stone Circles | Permalink.